There’s no shortage of competition when the Habouche brothers get together to play basketball. You see, there are three brothers playing high school basketball at three different Jersey City high schools. First, there’s Tahar Habouche, the oldest of the three. He’s making his mark as a senior at Ferris High School, averaging about seven points per game. And there’s Samir Habouche, the youngest of the three. He is a sophomore at Dickinson, currently playing with the Rams’ junior varsity. But it’s the middle brother who is worthy of all the attention in the family of late. 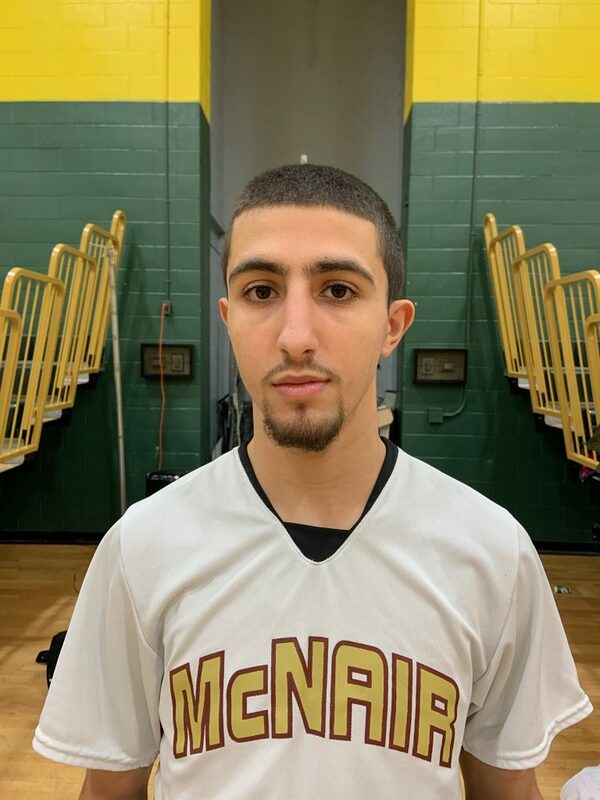 Adam Habouche is a senior at McNair Academic and he’s the leading scorer in all of Hudson County right now, averaging a little more than 22 points per game, a total that ranks him 17th in the entire state in scoring. Adam and Tahar are only a month apart. They share the same father, but have different mothers. It must be intense having three brothers playing high school basketball at three different schools in the same city. Adam Habouche is not only the best among his brothers, but he’s among the best in the entire county. Two years ago, that thought would have been a complete pipe dream. As a sophomore, Habouche scored only four points per game. Habouche grabbed his inspiration from one of the greatest players of all time. McNair Academic head coach Dave Masciale credited Habouche’s improvement to his former assistant coach Christian Cruz, currently an assistant to new head coach Jimmy Morley at Ferris. Masciale said that his current assistant Aliquan Smith also deserves credit in Habouche’s development. But it’s very hard to go from a four-point per game scorer as a sophomore to the county’s scoring leader as a senior. Masciale should know. He was a scoring machine during his playing days at Bayonne High School and later Long Island University. In recent weeks, Habouche has been on a scoring tear like none other seen in Hudson County quite a while. He is averaging 28.5 points over his last six games, tossing in 31 vs. University Charter (Jan. 15), 30 against Marion Thomas Charter (Jan. 17), 24 vs. Snyder (Jan. 24), 32 vs. Weehawken (Jan. 26), 31 vs. Hoboken (Jan. 28) and 23 points and 11 rebounds against Marist Jan. 29. For his efforts, Habouche has been selected as The Hudson Reporter Athlete of the Week for the past week. Habouche doesn’t really know why he’s become such a prolific scorer. A lot of things occur when a player goes hard to the rim with authority. One of the things that helped Habouche become a better scorer, going from just four points per game as a sophomore to the county’s leading scorer in just two years, has been his uncanny ability to use the backboard. It’s a lost art for some, but Habouche has become like former San Antonio Spurs superstar Tim Duncan in using the backboard as a friend. The other positive aspect of Habouche’s improvement is his ability to get extra shots to score while the clock is stopped. His production from the free throw line has been astounding. In just this latest six game scoring juggernaut, Habouche has connected on 39 free throws. “If I go hard to the basket, I’m bound to get fouled,” Habouche said. One other important sidelight to Habouche’s scoring prowess is his teammate Ismael Camara, who has averaged 19.3 points per contest over the last six games and dished off for 31 assists during Habouche’s torrid stretch. Camara and Habouche are rapidly approaching the 1,000-point scoring milestone. In fact, at press time, only three points separate the two close teammates – Habouche has 938 career points to Camara’s 935. It should be interesting to see who gets to the prestigious plateau first. Masciale says that Habouche is now drawing attention from some local schools like Felician (NCAA Division II) and Rutgers-Newark, Montclair State, William Paterson and Ramapo (NCAA Division III). Habouche is just overjoyed to watch his career blossom. The Cougars currently own a 10-8 record as the Hudson County Tournament begins to tip off this week. Habouche would like to continue with basketball as a career, either as a player somewhere or perhaps a coach, when his days at McNair are done.